Nothing to Do but Move Right In! 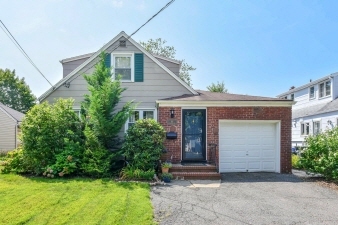 THIS IS A GEM - Renovated and Expanded 4 Bedroom, 2 Full Bath Cape Cod on quiet tree lined street. NOTHING TO DO BUT MOVE IN! The entryway w/ coat closet leads you to the open Living Room & Formal Dining Room featuring hardwood floors & lots of light. The beautifully renovated kitchen boasts maple cabinetry, granite counters, stylish backsplash and stainless steel appliances. Two bedrooms and an updated full bathroom complete the first floor & make it perfect for one floor living. Upstairs you will find two spacious bedrooms, including a master with walk-in closet. You will love the outdoor living space as you sit outside on the covered porch, barbecue on the patio or play in the yard. Basement is great storage space and ready to finish! Centrally located near shops, parks, schools and transportation. Bergenfield named #2 Best Place in NJ to Raise a Family by Bloomberg Businessweek.